Any organization that manages multiple supplier relationships can have a Profit Center program. Suppliers are motivated to directly engage revenue producers through the platform by maintaining and managing online catalogs to distribute content, add promotional material, create calls to action, and correspond with revenue producers. Revenue is generated by supplier subscriptions, advertising, and other e-commerce transactions. Members of an association, non-profit or other member organization are often willing to pay for access to platforms that offer content, education, training, and certifications. Vendors that want to market to these members will pay for online content catalogs, advertising, or home page placements. What are the features of the platform? Each platform comes with a home page that will be branded and customized with logos, banners, web pages, directories, an event calendar, and features. The platform is divided into online catalogs that be sold to organizations to customize, brand and add content, banners, videos, and events. The platform has an e-commerce engine to take payment, a CRM to track catalogs and members and a reporting engine to track payment and activity. How much does a profit center portal cost? Convey works with your company or organization to craft a customized pricing plan for each portal. 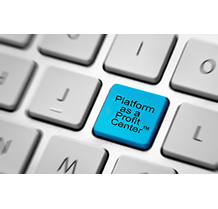 Profit centers are offered on a subscription basis or Convey will negotiate a wholesale price for catalog subscription and take a percentage of revenue for e-commerce transactions. Convey sets up and configures every portal and trains the organization to manage it. Any organization can outsource some or all of the management of the platform to Convey.